This recipe is from Coles magazine. 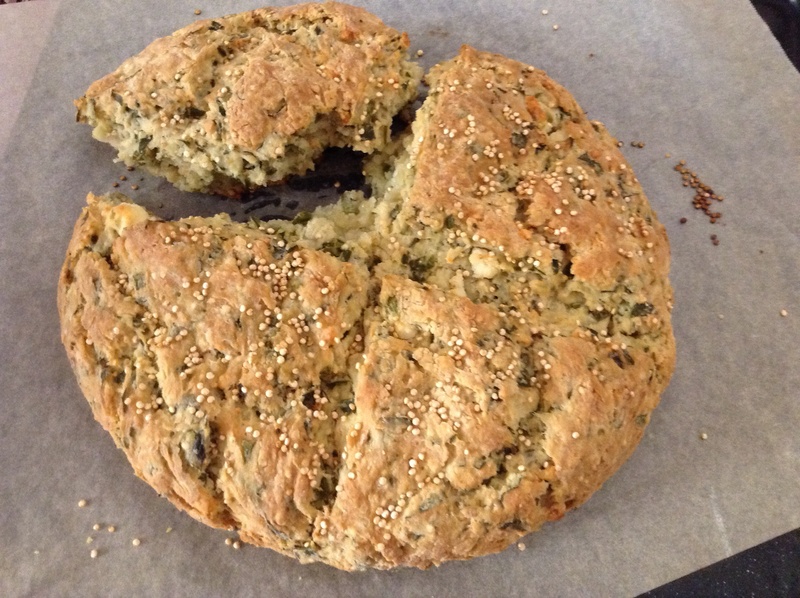 I really like the crunchiness in this QUINOA, SILVERBEET AND FETA SODA BREAD and I have to admit to buying silverbeet for the first time ever. It worked in this bread. And no need to say, it didn’t last very long. Excellent with butter, and best eaten on the same day it’s made. Preheat oven to 220°C. Line a baking tray with baking paper. Place the quinoa in a small bowl and cover with plenty of cold water. Set aside for 15 minutes to soak. Drain well. Place the flour in a large bowl. Use your fingertips to rub the butter into the flour until mixture resembles fine breadcrumbs. Add the silverbeet and feta and stir to combine. Add the quinoa and buttermilk and stir until a soft but sticky dough forms. (For a light textured bread, it’s important not to overwork the dough. It should feel soft but slightly sticky). Turn dough onto a lightly floured surface and gently knead until smooth. Shape dough into a 20cm-diameter disc. Place on the lined tray. Use a small sharp knife to cut a cross, about 1cm deep, into the top of the dough. Sprinkle the dough with extra quinoa. Bake for 15 minutes. Reduce oven to 180°C and bake for 30 minutes or until golden and loaf sounds hollow when tapped on base. Transfet to a wire rack to cool. Serve warm or at room temperature. You can also serve this bread with soup or a nice dip.